Not to be confused with Buhl Bull Pup or AGM-12 Bullpup. SVU-AS, a bullpup rifle with the action located behind the trigger. 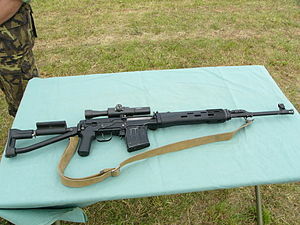 SVDS, a conventionally configured rifle using the same action. A bullpup is a firearm with its action and magazine behind the trigger. This creates shorter weapons in comparison to rifles with the same size of gun barrel. This means the advantages of a longer barrel such as muzzle velocity and accuracy are retained while reducing the overall size and weight of the weapon. The bullpup concept was first tested in 1901 with the British-made Thorneycroft carbine. But it was not until the Cold War that more successful designs and improvements made the weapon successful. In the 1970s, Austria became the first army in the world to adopt a bullpup rifle as a principal combat weapon. Since then the military in many countries have followed suit, such as the UK, China, Israel and Australia. The origin of the term "bullpup" for this configuration is unclear. In 1957, the word was reported to denote a target pistol, particularly one with a fancy stock. The bullpup design places the gun's action behind the trigger, usually in front of a short stock. The entire magazine is often also located behind the trigger group, though it is only necessary for the weapon's feed location to be located there for it to be classified as a bullpup; in some designs such as the Heckler & Koch G11 and Neostead the magazine or magazines extend forward rather than downward. The primary benefit of a bullpup weapon is that the weapon's overall length can be significantly decreased without reducing the barrel length. This allows a bullpup weapon to be maneuvered in tight spaces and concealed more easily than a conventional weapon with a similar barrel length. Because bullpups are held closer to the body, they cause less arm fatigue and allow a faster reaction time from a lowered position. In a bullpup weapon, the user's face is much closer to the action. This increases noise issues, can cause spent bullet casings to be ejected into the face of left-handed shooters and renders it difficult for a right-handed shooter to "off-hand" the weapon. For weapons with reciprocating charging handles, there is also the risk of the charging handle striking a left-handed user. As a result, bullpups often require unusual ejection mechanisms in order to allow ambidextrous operation. This is solved on some designs with ejection downward (FN P90, Kel-Tec RDB) or forward (FN F2000, Kel-Tec RFB). In weapons which have reversible bullpup actions, propellant gas can escape from the blanked-off side of the action. In the event of a catastrophic weapon malfunction, the user is more likely to be injured. Bullpups tend to have more weight concentrated rearwards than conventional weapons. As a result, they often lack balance, inducing muzzle rise and inaccurate automatic fire. However, this same distribution of weight also tends to make them very easy to move about quickly to engage targets in close quarters combat. The shorter weapon length often results in a shorter sight radius (when using iron sights), impairing accuracy at distance, as well as reducing bayonet effectiveness in close combat. However, since bullpups are more frequently used in close-quarters combat, modern rifles tend to use optical sights over iron sights, and bayonets are rarely used in modern combat, this is generally not a prominent issue. Due to the forward assembly and the necessary trigger linkage, bullpups tend to have less precise triggers. Thus, bullpup trigger pull characteristics are often criticized. Due to the unusual placement of the magazine and controls, shooters accustomed to conventional firearms will take longer to adjust to the manual of arms of a bullpup than they would a different conventionally laid out rifle. In particular, AK-type bullpups can be difficult to load due to their "rock and lock" mechanism. Bullpups often do not have adjustable stocks. Some weapons, such as the M16, use the space in the stock to store cleaning kits and other tools/accessories. For bullpup designs, these must be stored elsewhere or carried separately. The concept was first used in bolt action rifles such as the Thorneycroft carbine of 1901, although the increased distance from hand grip to bolt handle meant the decreased length had to be weighed against the increased time required to fire. It is known to have been applied to semi-automatic firearms in 1918 (6.5 mm French Faucon-Meunier semi-automatic rifle developed by Lt. Col. Armand-Frédéric Faucon), then in 1936 a bullpup machine pistol was patented by the Frenchman Henri Delacre. EM-2, an experimental British assault rifle of the 1950s. After World War II, Western engineers drew inspiration from the German Sturmgewehr 44 assault rifle, which offered a compromise between bolt-action rifles and submachine guns. Among them was Kazimierz Januszewski (also known as Stefan Janson), a Polish engineer who had worked at the Polish national arsenal during the 1930s. After being mobilized during World War II he escaped German and Russian forces and made his way to England, where he was a part of the "Polish design team" at Enfield Lock's Royal Small Arms Factory. The factory was run by lieutenant colonel Edward Kent-Lemon. As Januszewski was developing a new rifle, the "Ideal Calibre Board" was searching for a replacement for the .303 cartridge. The Board decided on an optimal 7 mm cartridge on which Januszewski and the two teams working at Enfield had to base their designs. One design team led by Stanley Thorpe produced a gas-powered rifle with a locking system based on the Sturmgewehr. The design used steel pressings which were difficult to obtain, and the design was scrapped. The result of the Polish design team's efforts was the EM-2, which broke significant new ground. The EM-2 contained some similarities to the Soviet AK-47, although Januszewski had never seen the Soviet rifle. The first significant bullpup assault rifle came from the British programme to replace the service pistols, sub-machine guns, and rifles. In the two forms of the EM-1 and the EM-2, the new rifle concept was born as a result of the experience with small arms that was gained during the Second World War. It was obvious that the modern warfare would require the infantry to be armed with a light, selective fire weapon, with effective range of fire much longer than that of a submachine gun, but shorter than that of conventional semi-automatic or bolt action rifles. The bullpup design was seen as a necessity to retain the accuracy at range while reducing overall length. The EM-2 was adopted by the UK in 1951 as the world's first (limited) service bullpup rifle, but was promptly displaced by the adoption of the 7.62×51mm NATO (0.308 in) cartridge, to which the EM-2 was not easily adapted. The decision was rescinded and a variant of the more conventional FN FAL was adopted in its place. A 7.62×39mm M43 calibre experimental assault rifle was developed by German A. Korobov in the Soviet Union around 1945, and a further development, the TKB-408 was entered for the 1946–47 assault rifle trials by the Soviet Army, although it was rejected in favour of the more conventional AK-47. The United States briefly experimented in the same year with the integrally-scoped Model 45A bullpup, which never progressed beyond the prototype stage; John Garand designed his T31 bullpup, abandoned after his retirement in 1953. After these failures of the bullpup design to achieve widespread service, the concept continued to be explored (for example: a second Korobov bullpup, the TKB-022PM). 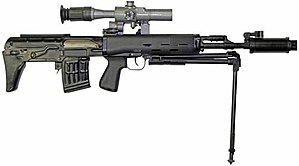 The L85A2 rifle, variant of the SA80 series of weapons. The Steyr AUG (selected in 1977) is often cited as the first successful bullpup, being in service with the armed forces of over twenty countries, and becoming the primary rifle of Austria and Australia. It was highly advanced for the 1970s, combining in the same weapon the bullpup configuration, a polymer housing, dual vertical grips, an optical sight as standard, and a modular design. Highly reliable, light, and accurate, the Steyr AUG showed clearly the potential of the bullpup layout. The arrival of the FAMAS in 1978, and its adoption by France emphasized the slide from traditional to bullpup layouts within gun designs. The British resumed their bullpup experiments with the L85, which entered service in 1985. Following persistent reliability problems, it was redesigned by the then British-owned Heckler & Koch into the L85A2, and it is now a reliable weapon. Having learned from extensive combat experience, Israel Military Industries developed a bullpup rifle: the Tavor TAR-21. The Tavor is light, accurate, fully ambidextrous and reliable (designed to stringent reliability standards to avoid malfunctioning in desert conditions), and is in increasing demand in other countries, notably India. The Tavor shares many similarities with the SAR 21 and the South African Vektor CR-21. The Islamic Republic of Iran Army has adopted the KH-2002 and the Chinese People's Liberation Army use the QBZ-95. Some sniper rifles such as the American Barrett M95 and XM500, German Walther WA 2000 and DSR-1, Chinese QBU-88, Russian SVU, and Polish Bor use the bullpup layout. It is also used for combat shotgun designs such as the Neostead and Kel-Tec KSG. AUT: Austrian Armed Forces – StG 77; selected in 1977. AUS: Australian Defence Force – F88 Austeyr; selected in 1989. ARM: Armed Forces of Armenia special forces – K-3; selected in 1996. China: People's Liberation Army – Type 95; selected in 1997. Croatia: Croatian Army – VHS; selected in 2009. FRA: French Armed Forces – FAMAS; selected in 1978. IRE: Irish Defence Forces – Steyr AUG; selected in 1988. ISR: Israel Defense Forces – IWI Tavor TAR-21; selected in 2001. The Tavor X95 was selected in November 2009 to become standard issue for all first-line infantry units except the Kfir and Paratroopers Brigade by 2018. NZ: New Zealand Defence Force – IW Steyr; selected in 1988. OMN: Royal Army of Oman – Steyr AUG.
Russia: Spetsnaz – OTs-14 Groza, A-91, and SVU; selected during the 1990s. SIN: Singapore Armed Forces – SAR 21; selected in 1999. UK: British Armed Forces – SA80; selected in 1985. BEL: Belgian Armed Forces – FN F2000; selected in 2004. SLO: Slovenian Armed Forces – FN F2000; selected in 2007. ^ Dalzell, Tom; Victor, Terry (27 November 2014). The Concise New Partridge Dictionary of Slang and Unconventional English. Routledge. p. 119. ISBN 978-1-317-62512-4. ^ a b c d e f Dockery, Kevin (2007). Future Weapons. Berkley Caliber. p. 64, 93-95. ISBN 978-0-425-21750-4. ^ Cutshaw, Charles Q. (28 February 2011). Tactical Small Arms of the 21st Century: A Complete Guide to Small Arms From Around the World. Iola, Wisconsin: Gun Digest Books. pp. 338–339. ISBN 1-4402-2709-8. ^ Tilstra, Russell C. (21 March 2014). The Battle Rifle: Development and Use Since World War II. McFarland. p. 18. ISBN 978-0-7864-7321-2. ^ Sweeney, Patrick (25 February 2011). "Kel Tec RFB". Gun Digest Book of The Tactical Rifle: A User's Guide. Iola, Wisconsin: Krause Publications. pp. 73–75. ISBN 1-4402-1892-7. ^ Sweeney, Patrick (10 May 2004). Modern Law Enforcement Weapons & Tactics. Iola, Wisconsin: Krause Publications. p. 189. ISBN 1-4402-2684-9. ^ Dugelby, Thomas B. (1984). Modern Military Bullpup Rifles: The EM-2 Concept Comes of Age. Collector Grade. pp. 21–47. ISBN 978-0-88935-026-7. ^ a b Dugelby, Thomas B. (1980). EM-2: Concept and Design. Toronto: Collector Grade Publications. pp. 258–260. ISBN 978-0-88935-002-1. ^ Cashner, Bob (20 August 2013). The FN FAL Battle Rifle. Bloomsbury Publishing. p. 12. ISBN 978-1-78096-904-6. ^ Cunningham, Grant (1 October 2015). "The Bullpup Rifle Experiment, Part 4: do they have a place in the home defense arsenal?". ^ Crossley, Alex (1 September 2013). "Gun Review: The VLTOR AUG A3". ^ a b Lewis, Jack (28 February 2011). Assault Weapons. Iola, Wisconsin: Gun Digest Books. p. 51. ISBN 1-4402-2400-5. ^ Hogg, Ian (1 June 2003). Handguns & Rifles: The Finest Weapons from Around the World. Globe Pequot Press. p. 36. ISBN 978-1-58574-835-8. ^ Lai, Benjamin (14 July 2016). The Dragon's Teeth: The Chinese People’s Liberation Army—Its History, Traditions, and Air Sea and Land Capability in the 21st Century. Casemate. p. 220. ISBN 978-1-61200-389-4. ^ McNab, Chris (24 March 2016). The Barrett Rifle: Sniping and anti-materiel rifles in the War on Terror. Bloomsbury Publishing. pp. 16–19. ISBN 978-1-4728-1102-8. ^ Dougherty, Martin J. (16 October 2012). SAS and Elite Forces Guide Sniper: Sniping Skills from the World's Elite Forces. Lyons Press. p. 92. ISBN 978-0-7627-8876-7. ^ Mann, Richard Allen; Lee, Jerry (20 November 2013). The Gun Digest Book of Modern Gun Values: The Shooter's Guide to Guns 1900-Present. Iola, Wisconsin: F+W Media. p. 576. ISBN 978-1-4402-3752-2. Pauly, Roger (2004). Firearms: The Life Story of a Technology. Greenwood Publishing Group. ISBN 0-313-32796-3. Westwood, David (2005). Rifles: An Illustrated History of Their Impact. ABC-CLIO. ISBN 1-85109-401-6. This page was last edited on 16 April 2019, at 15:55 (UTC).